The announcement by Senators Lee (R-UT) and Moran (R-KS) regarding their unwillingness to support the Better Care Reconciliation Act moves the nation one step closer to one of two scenarios – 1) a far more private, decentralized system associated with shrinking Medicaid and Medicare (the latter is about a decade away from insolvency) or 2) a single-payer, nationalized healthcare system. The emergence of either system will essentially answer the question of whether healthcare is a right or merely a privilege in America. Unless reappointed, Janet Yellen’s term as Federal Reserve Chairperson ends February 3rd, 2018. Who will be her successor? That’s an important question. Since February 1, 2006, there have only been two chairpersons – Ben Bernanke and Janet Yellen. From a monetary policy perspective, they are essentially the same person – determined to deliver full employment to America as speedily as possible and only slightly concerned by the possible formation of asset bubbles in the process. They are also immensely transparent. The approach over the past twelve years has been utterly different from that of Alan Greenspan, who delighted in being America’s monetary man of mystery. How will the markets respond to the next chairperson, who could conceivably return us to the days of Greenspan and the briefcase index? One could easily argue that capital is flowing to the wrong places from a societal perspective. While I have enormous respect for the operation of markets, I question whether it makes sense that hotel-related construction spending is up about 77 percent over the last three years and office-related construction spending is up 55 percent while spending on water supply is down 18 percent and public safety is down 11 percent. Has Baltimore Area Job Growth Really Slowed that Much? 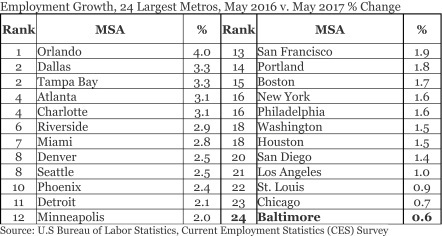 While Maryland is celebrating the recent decline in unemployment to 4.2 percent, the data also reveal that the Baltimore metropolitan area is now adding jobs more slowly than any of the nation’s twenty-four largest communities. Moreover, the establishment data indicate that much of the economic slowdown has occurred in the suburbs, not the city. Over the past year, the Baltimore region has added just 0.6 percent to its employment total according to the Bureau of Labor Statistics. 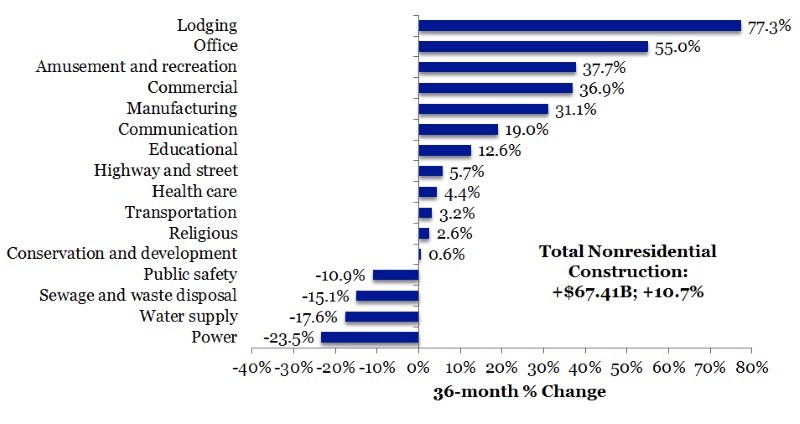 Neighboring Washington, D.C. has added 1.5 percent to job totals. The Orlando metropolitan area leads the way with an astonishing 4 percent performance, followed by Dallas, Tampa, Atlanta, and Charlotte. Each of these regions has experienced job growth exceeding 3 percent over the past year (May to May), which means that they are adding jobs at least five times faster than Baltimore.